Don't send boring Valentine's Day cards this year. 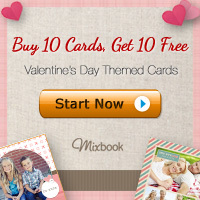 Get personalized Valentine's Day cards from Mixbook. From now until January 27th, when you buy 10 or more cards, receive 10 cards for FREE. To get this deal use code 10FREECARDS. You must have at least 20 cards in your cart for the offer to apply. This offer cannot be combined with other coupons, vouchers, Groupons, or applied after an order has been placed. Discount applies only to completed projects. No adjustments on previous purchases. Shipping and taxes will apply. Offer expires 01/27/2012 (11:59 pm PST). Limit ten free cards of equal or lesser value per order of 20 or more cards. Get your Valentine's Day cards today!